The adage "birds of a feather flock together" applies to fish, too. Random fish cannot be put into a goldfish's tank -- or any fish's tank -- without first knowing the environment each prefers and whether they'll get along. Some fish are more aggressive; some are faster swimmers and will get the food first. Goldfish are fairly easy to care for compared with other, fussier fish, but their owners need to be careful when adding new tank-mates. Common goldfish do best when kept with other common goldfish, while fancy goldfish do better in a tank with other fancy goldfish. Both can tolerate cool water temperatures -- preferably maintained between 65 and 72 degrees Fahrenheit -- but they cannot necessarily tolerate each other. 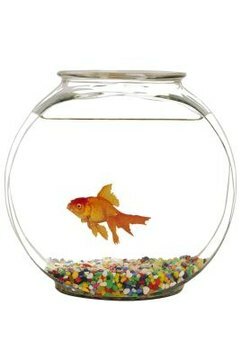 Owners who want to keep both kinds of goldfish should keep them in separate tanks. Common goldfish are faster swimmers than fancy goldfish. They're not aggressive, just faster. So at feeding time -- assuming both are hungry -- the common goldfish will always beat the fancy goldfish to the table. That means the fancy goldfish will be undernourished and may suffer stunted growth. Even worse, they may die from lack of food. With the speedier common goldfish constantly spinning past them, fancy goldfish can get hurt. Their longer, fluttering fins and tails can get nipped accidentally as the faster fish swim and play. Some fancy goldfish have "bubble" eyes that can also be injured easily. Feeding time is especially dangerous, as the common goldfish trip over their fancier tank-mates. Think of high school football players in a game with NFL players. The pros don't intend to hurt the slower guys, but it happens anyway, with serious consequences. If you're still determined to add variety to your tank, some fish are safer to try than others. Common goldfish can be in a tank with comet goldfish -- which are reddish orange compared with common goldfish's bright orange -- or Shubunkin goldfish. They all have the same elongated body shape and swimming style. Be sure to add fish of similar size, however, because a goldfish will eat any fish that fits into its mouth. Common goldfish also do well with koi in a pond. The goldfish spawn quickly, however, and can overpopulate the environment. Fancy goldfish can usually be harmonious tank-mates with danios and minnows. The white cloud mountain minnow has the classic minnow shape but is fancier, with fan-like fins, colorful tails and a stripe down the middle. Zebra danios are also minnows, but are sold under the danio name. Colorful fish with five horizontal stripes across the sides of their body, they will add interest and variety to any tank.